Sign up for our latest luxury holiday offers at Holidayboom.com. 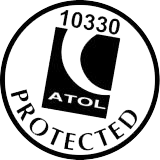 We are ATOL Protected. ATOL is a protection scheme for air holidays and flights managed by the Civil Aviation Authority (“CAA”). All tour operators and travel firms selling air holiday packages and flights in the UK as a principal are required by law to hold a licence called an Air Travel Organiser’s Licence (“ATOL”). Only ATOL Protected tour operators can provide the peace of mind and full financial protection. When you book with Holidayboom.com your bookings are safe with us, since we hold an Air Travel Organiser's Licence granted by the Civil Aviation Authority. Our ATOL number is ATOL 10330 In the unlikely event of our insolvency, the CAA will ensure that you are not stranded abroad and will arrange to refund any money you have paid to us for an advance booking. For further information visit the ATOL website at www.atol.org.uk. Airline Failure Insurance Every flight that we sell is also protected by Airline Failure Insurance (AFI). Our bonding with you: We will offer you the holiday of your choice with best price so that you can travel with confidence.